This hang tag is interesting. It has a few contradictions. It has an irregular shape, a circle with its outline interrupted by the outstretched hands of the kid. The character on the tag has a wide smile that dominates his face. Even his left hand has fingers splayed. These all seem to point towards a fun, carefree, irreverent attitude. Other elements, however, are somewhat conflicting. 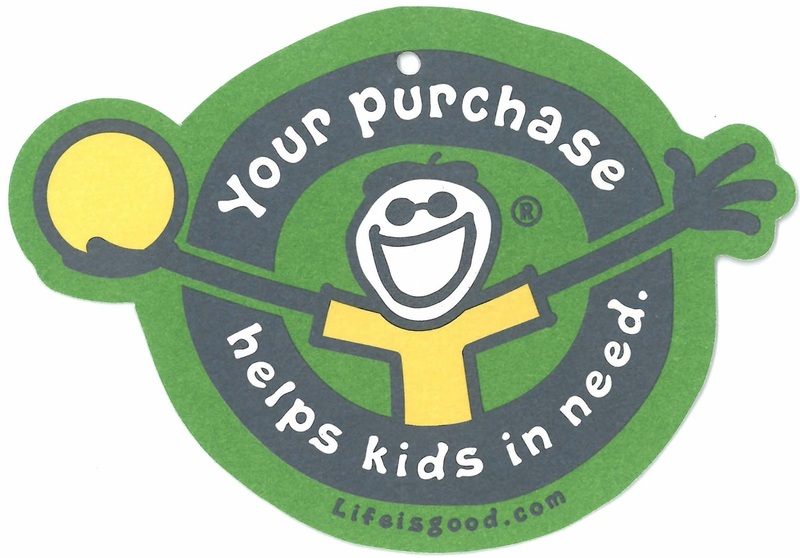 First and foremost, larger than any branding or identifying marks, is the message “Your purchase helps kids in need.” And while I like the deep, rich colors, they are surprisingly serious given the tone of the rest of the tag. One would expect bright colors instead of the dark forest green and navy blue that dominate. Even the yellow accents are heavily saturated. Perhaps it is because that while a noble goal, helping kids in need implies that there are needy children, not necessarily an inducement of optimism. The reverse is a bit more typical and expected. The trademark appears largely on the top, and the motto is featured on the bottom. 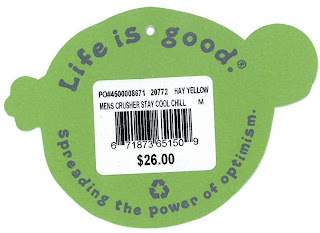 The arcing nature of both serves to keep the words flowing with the outline of the overall tag, and also provide plenty of space for the price sticker. Overall, I like this tag. It is interesting in that it is less of a product billboard and more of a simple statement of purpose. This is clearly a company that is selling an idea, the individual products are not the focus. Similar to when car companies give they models indistinct names to promote focus on the brand (see BMW with its 3, 5, and 7 series models). I also enjoy that the character is wearing a beret, and small detail that is well executed.